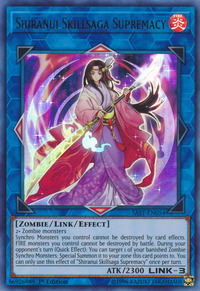 Synchro Monsters you control cannot be destroyed by card effects. FIRE monsters you control cannot be destroyed by battle. During your opponent's turn (Quick Effect): You can target 1 of your banished Zombie Synchro Monsters; Special Summon it to your zone this card points to. You can only use this effect of “Shiranui Skillsaga Supremacy” once per turn. This monster appears in the artwork of Fateful Hour.